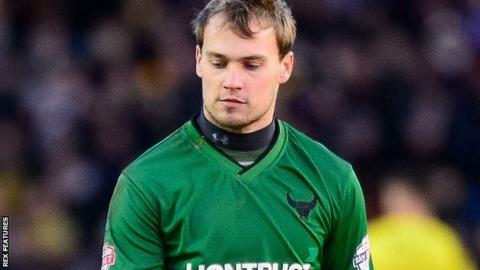 Oxford United boss Michael Appleton has shrugged off the error from goalkeeper Sam Slocombe which led to Mansfield's late equaliser on Tuesday. Slocombe failed to punch the ball clear before Stags' midfielder Jack Thomas bundled home to make it 2-2. Danny Hylton's two goals either side of half-time had seen the Us recover from a goal down in the League Two match. "The only problem with keepers making mistakes is normally it can cost you goals," Appleton told BBC Radio Oxford. "It happens and it will happen for the opposition when we play teams this season, no doubt about it. "A midfielder or a full-back makes a mistake and sometimes they can get away with it. Unfortunately for us tonight, it cost us two points but we move on." Appleton refused to say if Slocombe's place would be in doubt for the trip to Morecambe on Saturday after the 27-year-old was also at fault for Mansfield's first goal. "I'm not going to make those sorts of decisions five minutes after full-time," he said. "I think we've got two keepers (Slocombe and Benji Buchel) who have been competitive with each other all season."